Nature is full of wonderful creatures. One such beautiful creature is Birds. Looking at Birds, your heart is filled with overwhelming joy. Birds are found in every corner of the world. We just cannot imagine the sky without birds. Not only they are beautiful creatures; their sounds make us happy. We simply fall in love with birds. If you are wondering what the largest birds in the world are, then here is the post with the list of 10 Largest Birds in the World. These are the largest living birds on Earth. Birds fill our world like no other creature. With the rising sun, the birds can be seen making their flight from one place to another. They can be seen on trees, in the sky, even in your backyard. They are an integral part of our daily lives. Still, most of us know little about birds. However, this does not stop us from admiring these beautiful creatures. The twinkle in their eyes, their magnificent flight, or their colorful feathers, all make us admire these beautiful creatures. The children, young, and old, all love their chirping and humming sounds. Some birds are very large. Some of the large birds can fly while some of them can’t. That said, one is filled with excitement on spotting a large bird. Most of us are not aware of the large birds. So, we thought it right to come up with a presentation of largest birds in the world. Here, we have compiled a list of 10 largest birds in the world. So, if you want to know more about large birds in the world, then this post is a must-read for you. Here, you get to see largest living birds in the world. The list of 10 largest birds in the world begins with King Penguin. As evident by its name, King Penguin is the largest amongst penguins. King Penguin can grow to a height of 1 meter and can weigh about 14 kilograms. They usually feed on squid, small fish, krill, and other small sea animals. King Penguins are extremely social and help each other during an ice storm. They can dive in the sea to a depth of 100 meters. King Penguins mainly live in Antarctic and Sub-Antarctic Islands. Wandering Albatross is a large, beautiful bird native to Southern and North Pacific Ocean. Wandering Albatross can measure from 8.3 ft to 11 ft. They have the largest wingspan of any bird. There are about 24 species of Albatross in total. The Wandering Albatross is the biggest among the family. It can weigh up to 12kg. They mostly feed on small fishes and squids. They also drink lots of salt water. Albatross can be seen gliding in ocean winds. They float on Ocean surface. In fact, Wandering Albatross is rarely found on land. 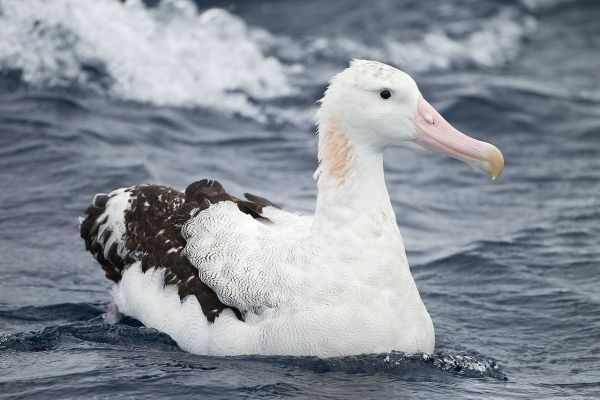 During their breeding season, Wandering Albatross gathered in colonies in remote islands. They lay only one egg after mating. Newly born Albatross makes it first flight within few months. Andean Condor is a large bird of the vulture family. It is mostly found in the Andes Mountains and South American coasts. They can grow to a height of 1.2 meters and weigh up to 15kg. Their wingspan can reach about 10 feet, which itself reflects its enormous size. The large wingspan helps them to make a flight with their massive body. Like other vultures, Andean Condors eat the dead bodies of other animals, both domestic and wild. They are also fond of eating dead seals and fishes from the coastlines. Sometimes they even hunt other bird’s nest for eggs. It’s an endangered vulture member and has a lifespan of 75 years. Mute Swan is native to European countries. It is a large water bird and grows to a size of 5 feet. It weighs about 12 to 13 kg. The Mute Swan has a large wingspan of 8 feet. They mostly feed on aquatic vegetation, small fishes, and insects. They have a long neck that helps them to find food under the water surface easily. They are intelligent can be a little aggressive at times. They would attack during nesting times and bite who threatens them. They usually lay 5 to 6 eggs after mating. Great Bustard has the status of being the heaviest flying bird in the world. It is about a meter tall and has a wingspan of 2.4 meters. Great Bustard weighs about 20kg. Female Bustard is smaller in dimension than their male counterpart. Great Bustard can live up to 10 years in the wild. They are omnivorous and take different food at a different season. Their upper portion and tail are covered with the brown and black wing. Their lower portion and the head are covered by whitish feathers. Lesser rhea is a flightless bird which is mostly found in southern part of South America including Chile, Bolivia, Argentina, and Peru. It is also known as Darwin’s Rhea. Lesser rhea can reach up to 1 meter in height and weight 28kg. It has a small head and relatively big body and neck. Lesser Rhea cannot fly. However, they can run at a speed of 60 km/hr. It has sharp claws which help in fighting with predators, protecting the egg, and in digging for food. They mainly eat fruits and grasses. Greater Rhea is another flightless bird that is found in the South American region including Brazil, Argentina, Paraguay, Uruguay, and Bolivia. It is larger and heavier than its counterpart Lesser Rhea. Greater Rhea can reach a height of 1.3 meters and can be as heavy as 40kg. Greater Rhea can live up to 10 years in the wild. Greater Rhea is similar to lesser rhea, the only difference being size and body mass. It is the largest bird in South America. 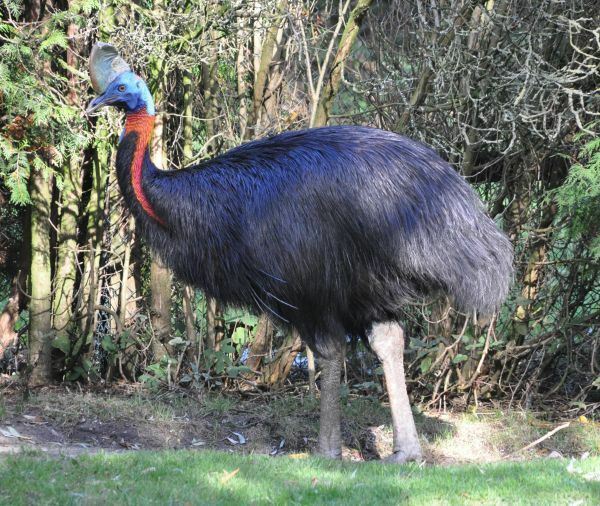 The Northern cassowary is a flightless bird with black plumage. It is the third largest bird in the world. They are mostly found in the islands of Yapen, Salawati, and Batanta. It weighs about 44kg. Their primary diet consists of fruits and small animals. They are also known as single-wattled cassowary. Southern cassowary is also known as Double-wattled Cassowary. It is the second largest bird in the world. They are a flightless bird and are mostly found in the tropical rainforests of Indonesia, New Guinea, and islands of Northern Australia. They usually eat fruits, insects, and small animals. Interestingly, the males incubate the eggs and Rare the chicks alone. Ostrich is the largest living bird in the bird. An adult ostrich can attain a height of 6 feet and can weigh up to 150kg. They have strong legs and can attain a maximum speed of 70 km/hr. They hold the record for the fastest speed of any bird in the land. The ostrich egg is the largest of any living birds. The flightless Ostriches are native to Africa. They mostly feed on fruits, seeds, flowers, small insects, and shrubs. They can live without water for several days. They usually live in groups that have 10 to 50 birds. A female ostrich can lay 60 eggs in a year. We hope that you found the article on 10 Largest Birds in the Word immensely interesting. If you liked the article, don’t forget to share it with your friends and loved ones. We welcome your comments and suggestions.